Thanks for visiting this website constructed by YTO Group. We have been in agricultural machinery, construction machinery and vehicle business for over 50 years. We produce our pickup trucks, farm tractors, road compactors, and diesel engines, etc. in strict conformation with ISO9001:2008 quality management system standard and ISO14001 environmental management system standard. So, our products are high quality and our production process is environmental friendly. This page will detail some distinct features of our pickup truck. Our pickup truck designers design our trucks based on popular design philosophy and international advanced techniques, thus creating high grade pick ups characterized by powerful force and simple and clean body lines. This pickup truck is designed with dual-safety-area. One is a flexible buffer area, and the other is a rigid compressive zone. 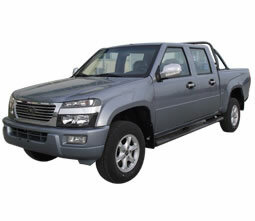 In addition, the pickup doors are manufactured with anti-collision steel girders to alleviate side impact forces and to ensure rear doors can be opened after collision. YTO pickup truck is designed with a multifunctional electronic instrument cluster which adopts adjustable brightness LCD. So, it can provide drivers with driving information conveniently. The GREEN constant temperature air conditioner control system can speedily lower down the temperature in the truck. Remote controlled central locking can realize intelligent door open and locking. Perfect sound insulation design greatly improves the sound reduction performance of our pickups. The pickup engine is made based on Japanese technology, so the truck engine is characterized by strong power, large toque, and low fuel consumption and it can start at a low temperature of -35℃. The adoption of double cross-arm, torsion bar spring independent front suspension helps ensure the pickup truck stability while turning and braking. In addition, the inflatable shock absorber gives higher comfortableness and high speed stability. In addition to pick up truck, we can also offer wheeled tractor, road roller and digger, etc. Due to reliable performance and competitive prices, our agricultural machinery, construction equipment and heavy vehicles are well received by customers from all over the world. For more information, please contact us directly. We are ready to serve you.